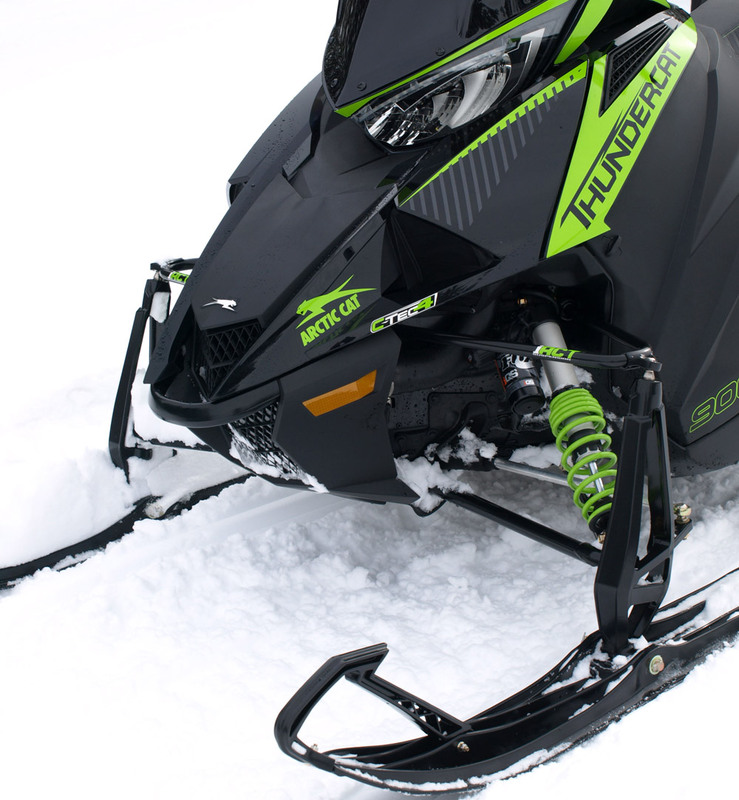 With 200 turbocharged horsepower on tap, the 2019 Arctic Cat ZR 9000 Thundercat with iACT is a true speed demon. Take no prisoners. Make no apologies. Hit hard. Hit fast. Build the quickest, fastest, most powerful production snowmobile money can buy. And give it a few features no other non-Arctic Cat produced sled has. 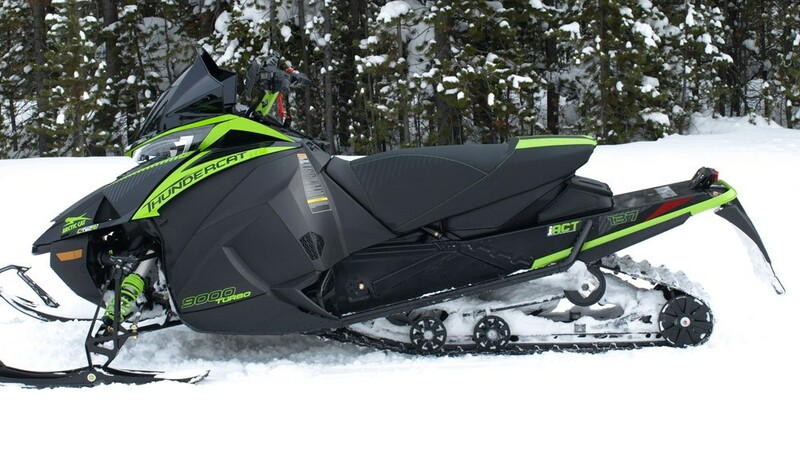 Meet the 2019 Arctic Cat ZR 9000 Thundercat with iACT suspension. It is all of the above and, in keeping with Cat’s go-fast heritage, it follows in a line of sleds like the Kawasaki-powered El Tigre 440, Suzuki-powered Wildcats and now a 200-plus horsepower Yamaha-powered Thundercat. Call it purpose built if your purpose is to be the fastest sled on the lake next winter. From the turbocharged four-stroke triple to the low-profile Ripsaw track, the 2019 Thundercat is meant to be fast and quick. Cat calls its 2019 T-Cat “the world’s fastest production snowmobile,” perhaps sharing that title with its production partner Yamaha and the 2019 SRX. Both of these go-fastest sleds share a 200hp-class turbo-charged 998cc triple that sets the industry standard for power, smoothness and reliability. Featuring an intercooled turbo and three injectors, the Yamaha-built four-stroke engine delivers maximum horsepower at any altitude with virtually zero lag. There will be a cloud of (snow)dust when you open the turbo on the 200-hp Thundercat. A joint project between Arctic Cat and Yamaha but designated as the 9000-Series C-TEC4 Turbocharged for the Thundercat, the engine produces 200hp class performance at 8750 RPM and features an intercooled turbo for maximum horsepower in all conditions. To achieve maximum performance and durability, the double overhead cam design is matched with new four-hole fuel injectors; engine braking control via an idle speed circuit and engine mapping; lightweight aluminum cylinders; and a press-forged crankshaft that allows ultra-quick throttle and turbo response. Although they share an engine, there is a difference between the Cat and Yamaha speed sleds. Where Yamaha specifies its own clutching, Cat uses Team clutching to get power to the track consistently. Cat’s partnership with TEAM results in quick acceleration and built-in reliability from the auto-adjusting design. The Thundercat’s Arctic Drive System features TEAM Rapid Response II drive and Rapid Reaction BOSS driven clutch combination for smooth shifting and all around optimal performance. 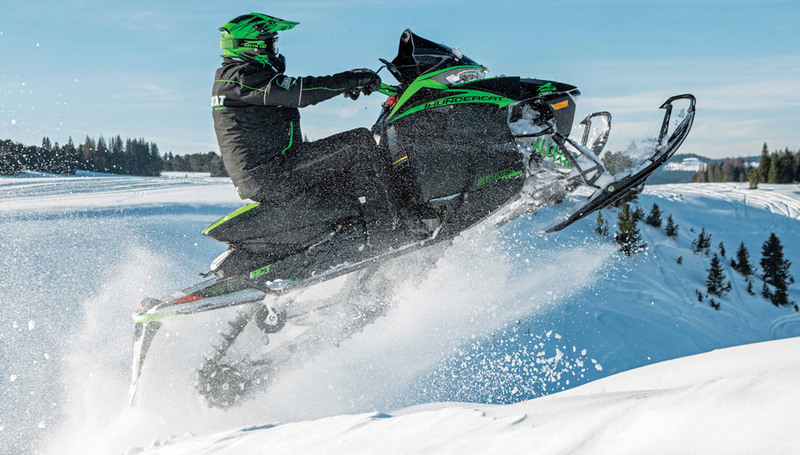 Another plus for the 2019 Arctic Cat ZR 9000 Thundercat is the system’s proven durability, enhanced serviceability and reduced weight. A roller bearing on the shaft drive clutch allows for an auto-adjusting belt tension design that delivers consistent performance without manual adjustments. The drive has a 12.5% lower effective starting ratio (while still maintaining the top ratio) for smoother engagement and reduced belt wear at drive-away speed. 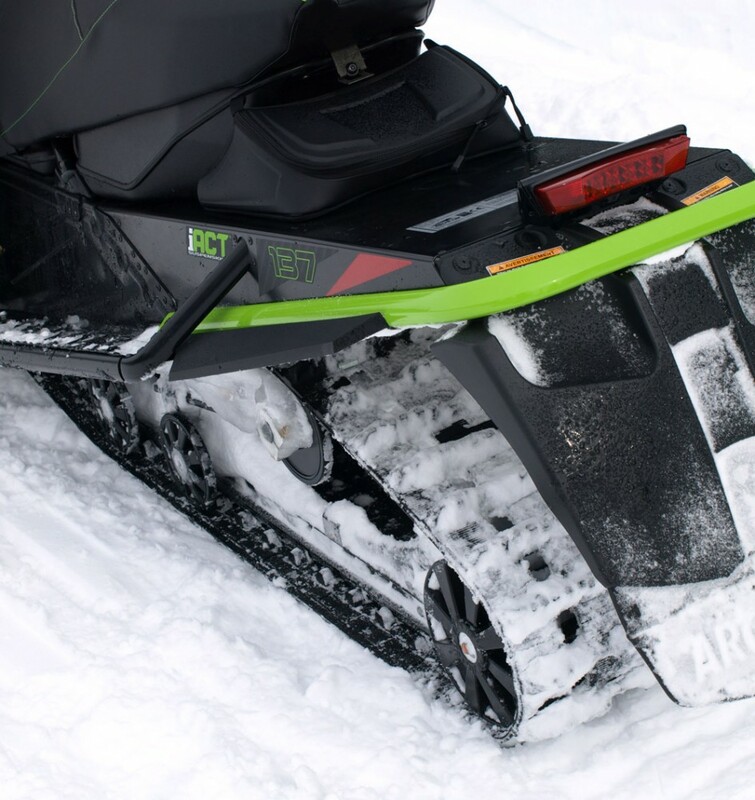 This distributes more evenly distributed force for lower belt pressure and is a feature unique to Arctic Cat. The Thundercat presents an almost “stealth” profile in its modest black trim. Be wary of the Thundercat logo, it means something ominous for the competition. The TEAM Rapid Reaction BOSS driven clutch features the Built On Shaft Secondary design, in which the clutch has machined sheaves that mount directly to the machined-matched driven shaft. Also unique to Arctic Cat, the BOSS eliminates the need for the steel clutch post in traditional designs, saving weight, reducing rotating mass, improving clutch balance and achieving tighter clutch/shaft mounting tolerance. In addition, the Rapid Reaction driven clutch features optimized cooling fin geometry for improved component cooling temperatures of clutch and drive belt that is claimed to enhance belt life and performance. The design is also 0.25 lbs lighter than previous designs, resulting in quicker acceleration. While speed is key, controlling power and speed is paramount and gets an assist from a new Stealth Lightweight Brake master cylinder, which provides enhanced braking performance in a more protected design and with a more comfortable short-throw brake lever. 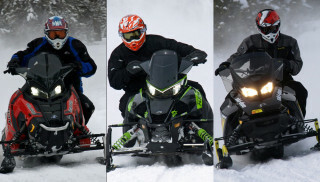 The handlebar-mounted left hand control module is new for 2019 and is more intuitive for on-snow interaction of heater control, mode changes and such. Power is a given with a speed sled, but the Thundercat adds the integrity of its ProCross Chassis, Cat’s lightest, strongest and most-capable chassis. The race-bred platform incorporates aluminum extrusions, stampings, forgings and castings in a design that ties together many of the loadbearing chassis components with a forged steering housing. The T-Cat reflects a lower profile from past models that effects a slippery shape through the air. Cat’s easily identifiable tall spindle ARS (Arctic Race Suspension) combines that signature detail with widely spaced A-arms to maximize torsional rigidity and strength. Mounted to the chassis at an angle from the chassis centerline, the lower A-arms geometry of caster and camber angles improve comfort and cornering traction while reducing bump steer. One-piece spindle construction with ball joints reduces weight and the “stiction” of spindle-in-housing designs. Cat’s no-nonsense coupled Slide-Action rear suspension design is unique as its front arm features a U-shaped slot that fits over a fixed shaft (attached through the tunnel) to allow a half-inch of sliding movement. Unlike all other coupled suspensions, this “non-fixed- front arm-location” doesn’t force the front arm to collapse whenever the rear compresses. The result is the full benefit of rear coupling – controlled (or eliminated) ski lift during acceleration – yet with complete use of the front arm travel at all times. The Slide-Action suspension also incorporates Cat’s Torque-Sensing Link that allows lower and more consistent track tension; three-position rear coupling block adjustability; adjustable spring preload; and a new-for-2019 three-wheel rear axle assembly that’s more durable and consistent in performance. 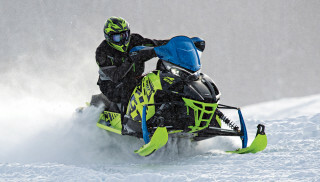 While the ARS and Slide-Action suspensions should be more than adequate for a true go-fastest sled, Cat gives its 2019 Thundercat an incredible edge for trail performance with its exclusive iACT interactive suspension. 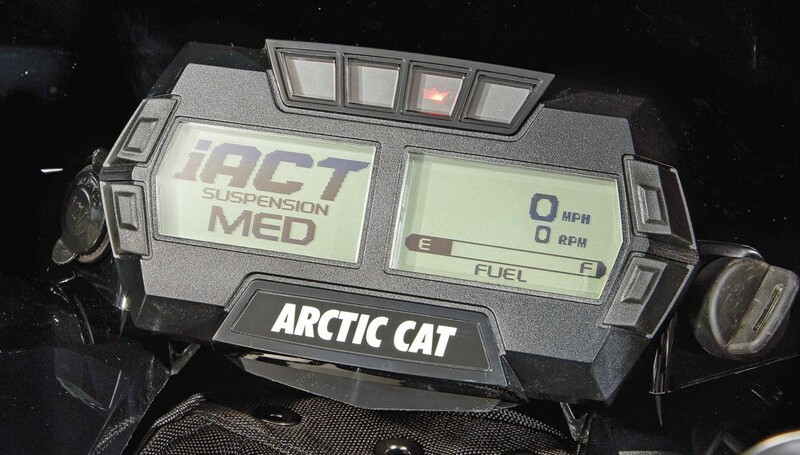 This interactive Arctic Cat Technology (iACT) sets a new standard for from-the-saddle adjustability, giving Cat riders instant on-the-fly adjustability of ride settings on select Arctic Cat snowmobiles such as the Thundercat iACT. The large digital display helps you track the instant-response of the iACT suspension setting. Basing the system on Fox’s popular quick switch QS3 shocks, Cat’s iACT activates the QS3’ three levels of firmness via electronically activated servo motors that are set via handlebar-mounted pushbutton control. The system simultaneously works the two front suspension shocks and the rear suspension FOX ZERO iQS gas shocks via an electronic control system designed and developed with Arctic Cat Technology. 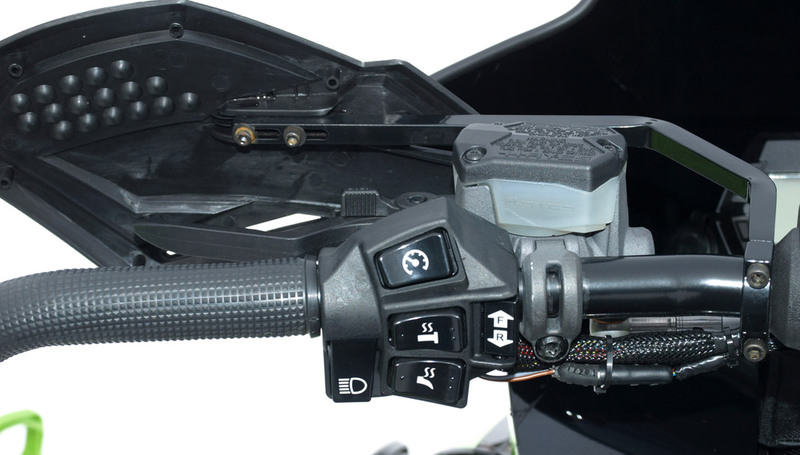 Wired directly to a shock control module (SCM) on both ski shocks and the rear track shock, the thumb-operated button on the left-hand controls of the handlebar allows the rider to switch between the three settings while riding. The QS3 shocks come with piggyback reservoirs and three compression settings corresponding to Soft, Medium and Firm. In our many test miles we found the system worked as promised and reacted in a literal blink of the eye – or about two-tenths of a second. Cat’s new more intuitive left-hand console houses the iACT controls, reverse button and mode selection. For 2019, Cat (and production partner Yamaha) will have an exclusive on this arrangement, but we anticipate competitors wanting to create their own version for the future. The servo-operated Fox QS3 shocks will be the base piece, but the trick, as Cat engineering discovered, will be in the details of establishing the computerized module to talk to the shock and how to hook up and wire that module to the sled so that it doesn’t break when hitting a serious row of deep whoops! We don’t see Cat sharing that knowledge in the short term. There is no other system as quick and easy as the iACT design. Ski-Doo’s air ride suspension is much slower and only alters the rear suspension arm. Serious suspension tweaksters may not favor a three-mode system as their rMotion or multi-click mode shock set up can be more precisely configured for an exacting ride. But, for the majority of us, the iACT system is a very, very nice to have suspension. It works. You can get big air with the T-Cat but getting to point B first and fastest is the intent of this 200-plus horsepower sled. 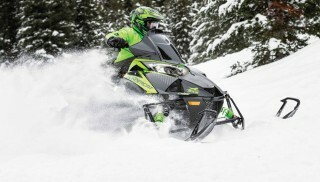 The 2019 Arctic Cat ZR 9000 Thundercat 137 with iACT works. It is fast, and it accelerates like you’d expect a 200-plus horsepower sled to accelerate. Yet it exceeds expectations as the Yamaha turbo is incredibly rider friendly whether you are tooting along on a grey-hair safari or leading the pack with your 850-riding buddies. This sled is biased to being fast as one look at its one-inch profile 137-inch Ripsaw track attests. This Thundercat will be studded and its low profile front end with be pointed down long stretches of icy ribbon lake surfaces waiting for the competition to challenge its power. The stock Ripsaw track features a one-inch lug profile. While waiting for those inevitable challenges, the 2019 Arctic Cat ZR 9000 Thundercat rider can tune in one of two heat settings on his saddle, hunker behind an 11-inch windscreen and simply enjoy a cruise back and forth to the challenge site. Fast it is, but extremely trail worthy is this Thundercat as well. 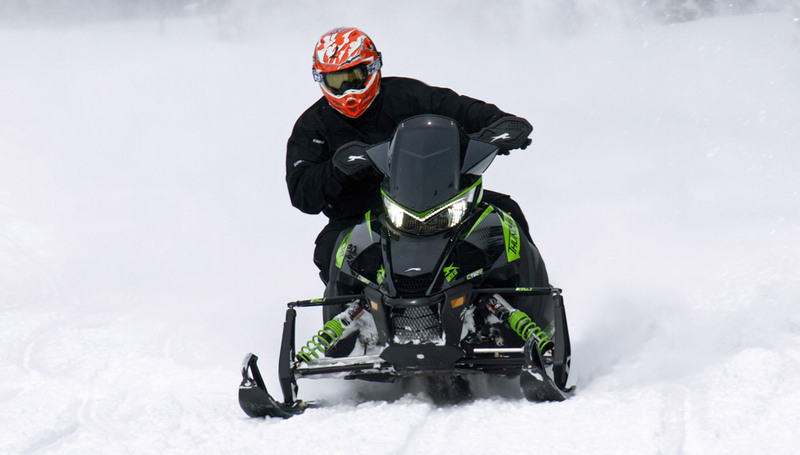 But fast it is – in the truest heritage of Arctic Cat go-fast sleds.